Wed, Feb 13, 2019, 12:57 pm SL Time, ColomboPage News Desk, Sri Lanka. Feb 13, Colombo: Prime Minister Ranil Wickremesinghe officially launched the Citra, Sri Lanka's first Social Innovation Lab co-developed by the Ministry of Science, Technology and Research and the United Nations Development Programme (UNDP), at Galle Face Hotel in Colombo today (February 13). As Sri Lanka's first Social Innovation Lab, Citra works to strengthen institutions, build capacities of the public sector, and re-engineer public service delivery through specialized foresight and innovation tools, such as design-thinking, user-journey mapping exercises and human-centered design approaches, among others. 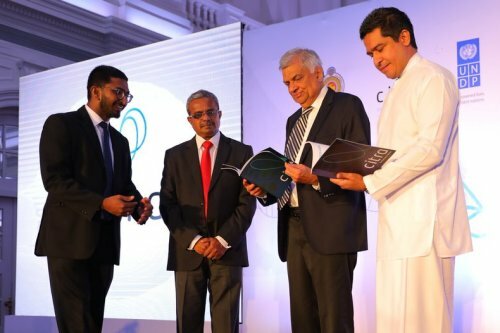 Speaking on the added value of an Innovation Lab to the Public Sector, Prime Minister Ranil Wickremesinghe said the State sector will receive many benefits from the Innovation Lab. "Great to see the results of the Citra Social Innovation Lab within a year of existence - how programs have been carried out, the number of ministries the lab has partnered with, all those engaged and involved in social innovation who want to make a change in society." "The Government should actively work in close collaboration with partners to create a comprehensive framework and redesign structures to address the problems of tomorrow to achieve the 2030 Agenda," he added. The work of Citra began in the first quarter of 2018 and has already been instrumental in delivering key initiatives of value-addition to the work of the Government in Sri Lanka through innovative design interventions, and particularly through the Foresight and Innovation for Public Sector Excellence program aimed at equipping select public sector officials with the necessary skills and tools to become catalytic agents in Sri Lanka's development efforts. Speaking at the event, non-cabinet Minister of Science, Technology & Research said this laboratory will add value to the country and he looks forward to working closely with the Citra and its stakeholders to streamline and target key areas of focus to be a result driven and innovative arm of the Government. "The Ministry is proud to be an anchor for Citra Social Innovation Lab within the Government. The work the Lab has been carrying out is of definite value to the country, and on behalf of the Ministry, I look forward to continuing our support extended to Citra to ensure they are able to provide effective solutions to the country's needs," he added. Sri Lanka Resident Representative of UNDP Jorn Sorensen delivering the opening remarks said the said the future is full of challenges and embracing the complex world requires the agility and innovation. "From what started as a simple idea in 2016, to the establishment of Sri Lanka's first Social Innovation Lab, being a part of the journey of Citra has been a truly rewarding experience for us at UNDP. I want to take this opportunity to thank all our partners, especially the Government of Sri Lanka, for being with us on this journey. We count on your continuous support, so together we can achieve much more, to realize the vision of a sustainable tomorrow." The Innovation Lab, which works in line with national development priorities and empowers selected government officials in country's development activities while bringing in greater citizen engagement to the formulation of development solutions, began its work a year ago. Citra's first annual report 'Our 1st Year In Review', was also launched at the event, further detailing the work undertaken and partnerships established in its inception year. Having successfully achieved several key initiatives in partnership with many stakeholders since being in operation for less than a year, the Citra Social Innovation Lab remains committed to working closely with the Government in envisioning a future-ready and sustainable Sri Lanka, the UNDP said.